Title 24 is a set of mandatory requirements in California for fenestration products & exterior doors. These requirements were originally implemented in 1978 to establish energy efficiency standards for residential and non-residential buildings; these standards are updated periodically. Manufactured window, glass doors, and skylights. Cover Glass USA’s Frameless sliding glass doors are Title 24 compliant. Cover Glass USA, is ASTM E 283 approved, per section 110.6 above. Cover Glass frameless sliding glass doors are considered site-built fenestration (curtain wall of glass operable panels). 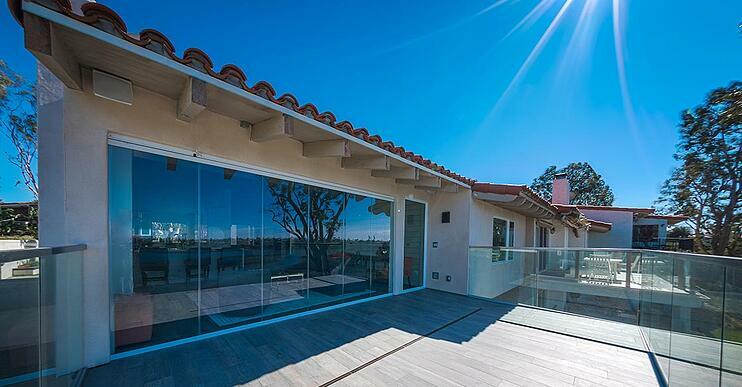 Cover Glass frameless sliding glass panel systems are weatherproof. Cover Glass panels are Low-E coated to ensure maximum energy efficiency and function.